A single panel remaining from a triptych probably intended as an altarpiece, this is often seen as one of his lesser works. However, it still contains masterly passages in the details of the people shown. Credits: © Kunsthistorisches Museum, Gemäldergalerie, KHM-Museumsverband, Wenen, via Wikimedia Commons. Many altarpieces in churches consist of panels showing scenes from the passion of Christ, of which the centre normally shows the crucifixion itself. 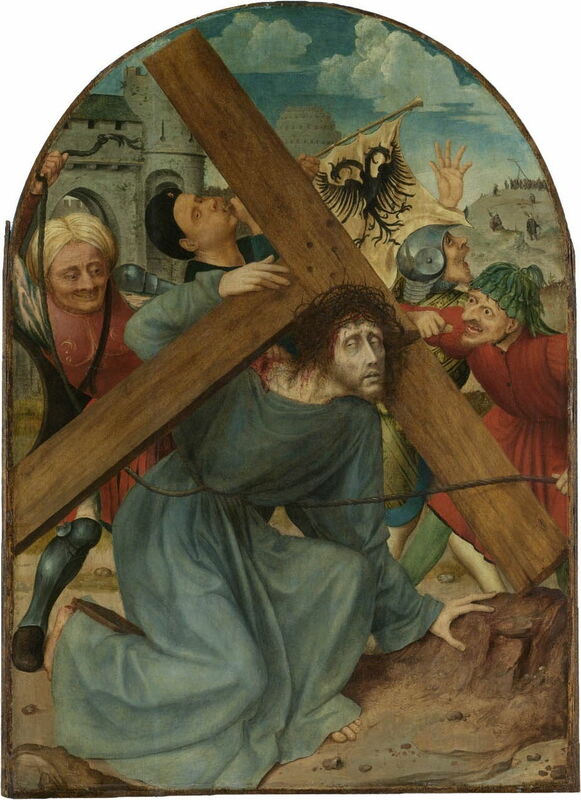 The left panel of a triptych then shows a scene prior to the crucifixion, such as Christ carrying the cross, and the right panel a scene after Christ’s death, such as the deposition of Christ’s body from the cross, or its entombment. The underlying accounts in the Gospels of the New Testament are very brief, although Bosch as usual works from that of John (chapter 19 v 17), which records Christ as carrying the cross himself; the other Gospels refer to the cross being carried by Simon of Cyrene. This painting also refers to a later tradition that, of the two criminals crucified alongside Christ, one repented to become the ‘good thief’, and the other did not. A hillside near the summit, with two paths ascending from left to right. 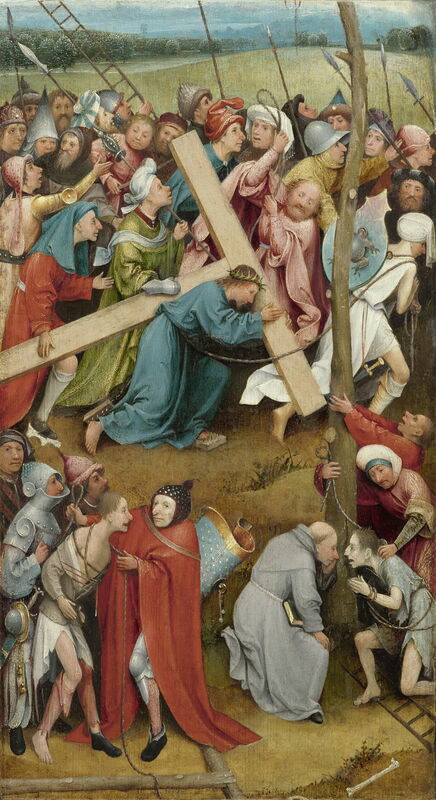 On the upper path, Christ struggles to carry his cross alone, surrounded by a tight-packed crowd. On the lower path, the two criminals are seen, one with his cross on the ground, the other having his cross erected. Christ is dressed in a blue robe, and wears his crown of thorns. Suspended from his waist are two spiked wooden boards which fall where his feet are placed, impaling them as he walks. He bears on his left shoulder a large, finished T-shaped crucifix on which he will shortly die. Behind Christ, a bearded man (who may represent Saint Peter, from his appearance and robes) lashes Christ using the loose end of a rope to which Christ is tied. The other end of the rope leads to a young man, dressed in white, who is leading Christ along. Strapped to that man’s back is a shield of strange shape, on which the image of a bloated frog or toad is painted. The crowd on that path consists of 23 faces in addition to Christ. Several bear spears, a few wear armour, and few are looking at Christ. Most, if not all, are men, and many of their faces imply stupidity or hostility. On the lower path, there are only nine men. At the left, a group of four surround one of the two criminals who will be crucified alongside Jesus. That ‘bad thief’ is partly bound with ropes, wears tattered clothes, and is talking. His cross, roughly hewn and still covered in its bark, rests on the ground by his feet, one of which is bare. The crucifix for the other criminal is being set in the upright position at the right, and consists of a rough-hewn trunk still covered in its bark. That criminal, the ‘good thief’ kneels at its foot, apparently making his confession to a Franciscan monk. A ladder rests on the ground under his feet, and there is a human longbone near that. Behind these crowds is the rolling partly-wooded countryside of Brabant, with a town in the far distance. There are no other people (or creatures) visible. Hieronymus Bosch (c 1450–1516), Christ Child (1490-1510) (CR no. 12B), oil on oak panel, 59.7 x 32 cm, Gemäldegalerie, Kunsthistorisches Museum, Vienna. © Kunsthistorisches Museum, Gemäldergalerie, KHM-Museumsverband, Wenen, via Wikimedia Commons. 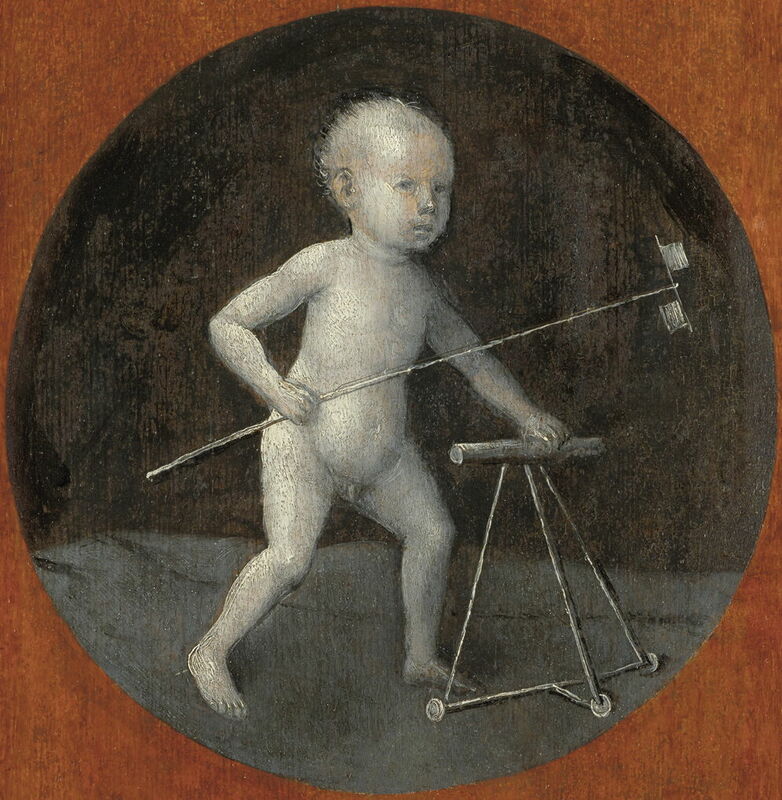 The reverse, which would have formed the exterior of the triptych when folded, shows an infant Christ holding the bar of a wheeled walking aid with his left hand, and a ‘whirligig’ or windmill toy with his right hand. Unless another panel of this triptych were to be found (unlikely but not impossible), we do not know how much of the top of this panel was removed, nor what was on it. 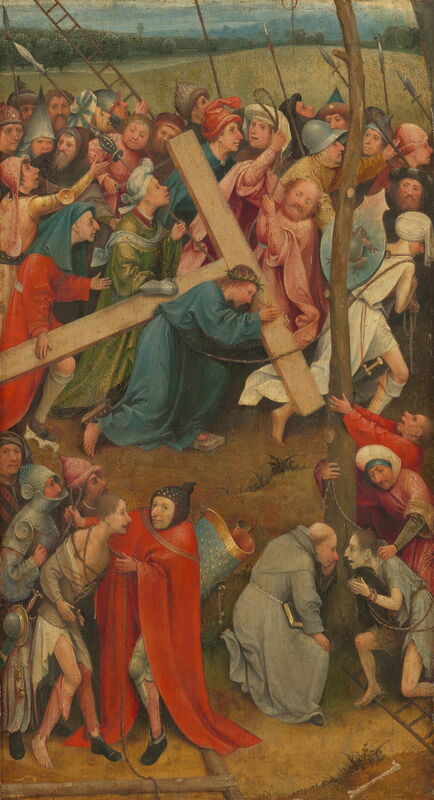 What remains is an unusual composition by any means, and is possibly unique for paintings in this period of the carrying of the cross, in its double-decked arrangement. 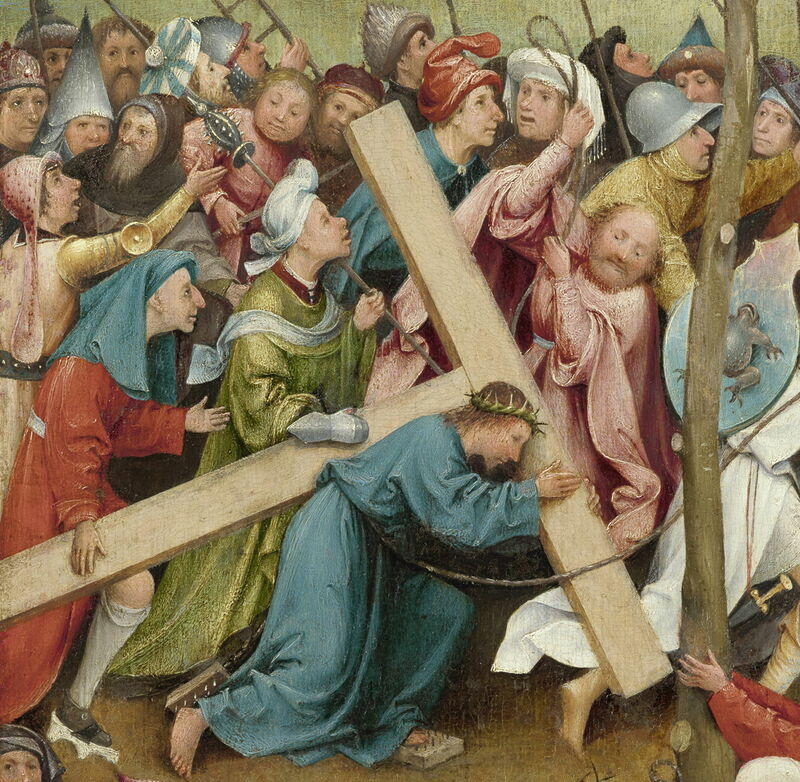 That adopted by Hans Memling in his earlier Carrying the Cross (c 1475) was among the more popular approaches, showing Christ leaving the gate of Jerusalem, and without the two criminals for crucifixion. Master of the Virgo inter Virgines (fl. 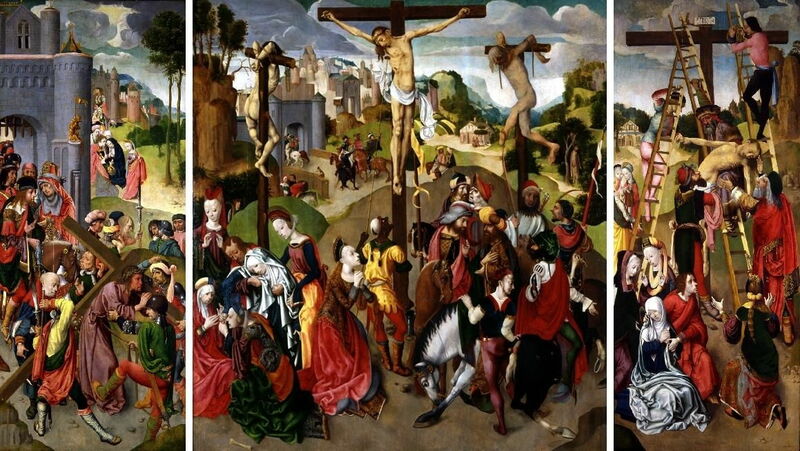 c 1480-1495), Triptych with the crucifixion, carrying of the cross and the deposition (c 1495), oil on panel, centre panel 218.8 × 196.3 cm, each wing: 219 × 93 cm, Bowes Museum, Barnard Castle, Co Durham, England. Wikimedia Commons. Memling’s composition is almost identical to the left panel of the Master of the Virgo inter Virgines’ triptych (c 1495), which gives a good idea as to how Bosch’s panel might have been completed into a triptych. Quentin Matsys, in his Christ Carrying the Cross (c 1510-15), shows a similar scene from much closer in, concentrating on Christ and a handful of those abusing him. Interestingly this appears to feature the Tower of Babel in the background. 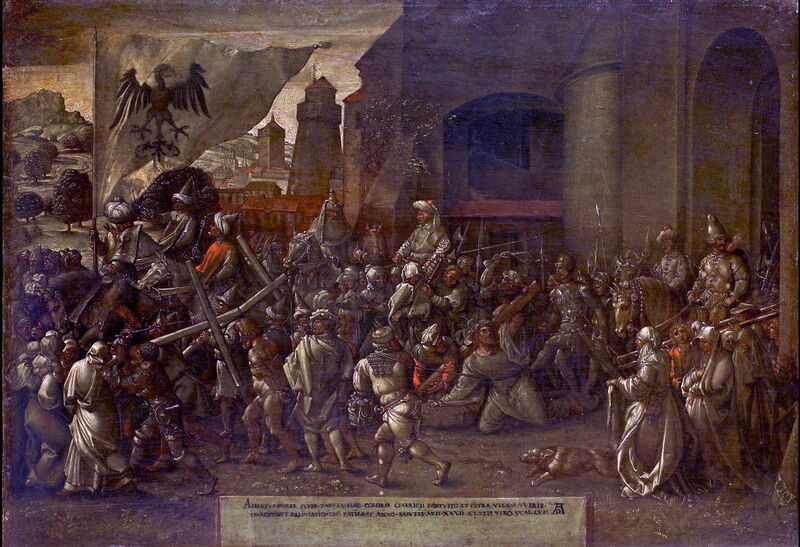 Albrecht Dürer (1471–1528), The Way to Calvary (1527), oil on panel, 32 x 47 cm, Accademia Carrara, Bergamo, Italy. Wikimedia Commons. Albrecht Dürer’s slightly later The Way to Calvary (1527) uses a larger crowd in a linear composition, which includes Christ and both criminals, but loses Christ among the crowd, and has become impersonal, almost emotionless and unmoving. Bosch’s composition is a more complete account, in drawing comparison with the two criminals, and being close enough to show many of the ugly details in the crowd. It draws the gaze towards the right, where we would have seen the crucifixion itelf, brings the viewer into almost personal involvement, and portrays the atmosphere. There are striking similarities between figures around Christ and those seen in The Crowning with Thorns. The man dressed in green just behind Christ wears a turban and an armour glove, just as shown in the crossbowman placing the crown of thorns on Christ’s head, although his face is quite different. Even more similar is the man wearing a blue chaperon on his head with red robes, to the left of that green man, who resembles the mean-looking man at the lower left in The Crowning with Thorns, without the whiskers. The meaning of the prominent frog motif is unclear. The group around the unrepentant bad thief is also interesting, largely because the man at the extreme left is looking directly at the viewer, and has no apparent role in the painting. This suggests that it could be an embedded portrait, if not of Bosch, of someone else associated with this panel. 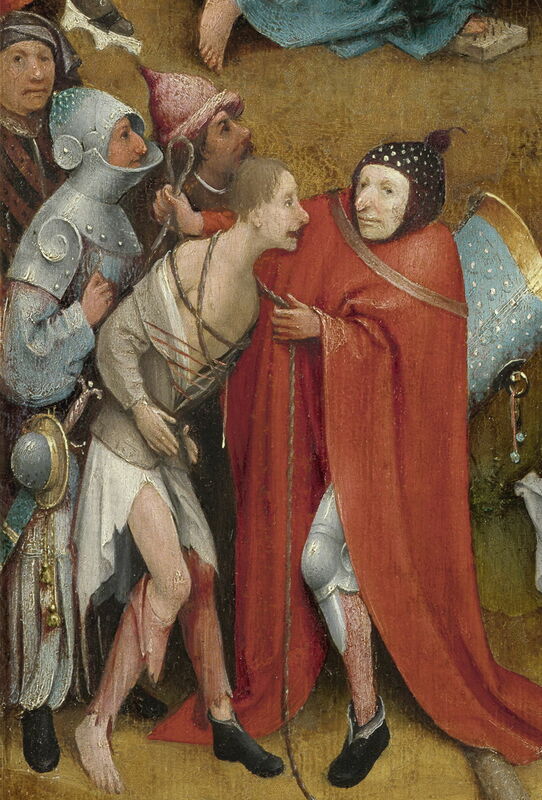 This detail also shows the unusual blue and gold shield at the back of the man in the red cape, who is attending to the bad thief, and the latter’s fragmentary clothing. Because much of the background was lost when the panel was cut down, there is disappointingly little to see in the remaining landscape, apart from its utter lack of people or other creatures. The tall structure at the top of the hill is likely to have been to carry a beacon, rather than anything to do with the crucifixion. This painting has not apparently been the subject of any dispute as to it being an authentic work by Bosch’s hand. It was altered considerably when the original triptych was broken up, the top section being removed, material added to the top right corner to fill it into a rectangle, and some of the bottom was also removed. Hieronymus Bosch (c 1450–1516), Christ Carrying the Cross (before conservation work) (1490-1510) (CR no. 12), oil on oak panel, 59.7 x 32 cm, Gemäldegalerie, Kunsthistorisches Museum, Vienna. © Kunsthistorisches Museum, Gemäldergalerie, KHM-Museumsverband, Wenen, via Wikimedia Commons. This painting has recently undergone extensive conservation work by the BRCP. Prior to this, it appeared much duller, as shown above (compared with the post version at the top of this article). This work has restored much of its earlier sparkle. Matthijs Ilsink, Jos Koldeweij et al. (2016) pp 236-247 in Hieronymus Bosch, Painter and Draughtsman: Catalogue Raisonné, Yale UP and Mercatorfonds. ISBN 978 0 300 22014 8. Posted in General, Painting and tagged Bosch, Dürer, Matsys, Memling, painting. Bookmark the permalink.